Other African Americans who have won Rhodes Scholarships include Randall Kennedy of Harvard Law School, Kurt Schmoke, former mayor of Baltimore, and Franklin D. Raines, former director of the Office of Management and Budget and former CEO of Fannie Mae. In 1978 Karen Stevenson of the University of North Carolina at Chapel Hill was the first African-American woman selected as a Rhodes Scholar. Many college-bound high school seniors will have difficult decisions to make as summer approaches, but few can compare to the choice facing New Jersey teen Ifeoma White-Thorpe – she was accepted to all eight Ivy League colleges. White-Thorpe, 17, from Morris Hills High School in Rockaway, New Jersey, was accepted into Harvard, Yale, Columbia, Cornell, Princeton, Brown, Dartmouth, and the University of Pennsylvania. And that’s not all. White-Thorpe was accepted into Stanford University, too. At first, she was solely focused on Harvard — the first school to officially give her the green light. But acceptance letters from other prestigious schools across the country soon flooded her mailbox, and now she’s back to square one. “I got into Harvard Early Action, so I was like I’ll just go there. And then I got into all the others and now I don’t know where I want to go,” White-Thorpe told CBS Philly on Tuesday. The teenager already has quite an impressive list of accomplishments. She’s student government president, ranks high in her advanced placement courses and is a talented poet and writer. She recently won first place in the National Liberty Museum’s Selma Speech & Essay Contest.“Education is essential for change, and I aspire to be that change,” White-Thorpe said after winning a $5,000 prize in the national essay contest. White-Thorpe says she wants to major in global healthy policy, and plans to look into what programs each school offers in her field. But that’s not the only factor that will help make her decision. It will likely come down to whichever university provides the best financial aid package, she said. All eight Ivy League schools — Harvard, Yale, Columbia, Princeton, Cornell, Dartmouth, Brown, University of Pennsylvania — have offered Long Island, New York high school senior Augusta Uwamanzu-Nna places in their freshman class. In addition to the Ivies, she was accepted by Johns Hopkins University, Massachusetts Institute of Technology, New York University and Rensselaer Polytechnic Institute. 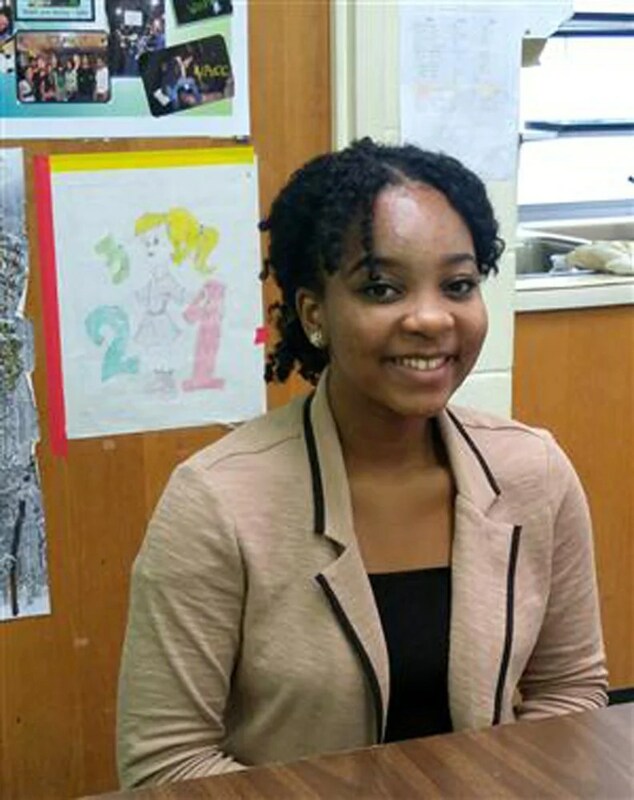 Augusta is valedictorian at Elmont Memorial High School, where she has a 101.64 weighted grade point average. The school is no stranger to academic superstars: Last year, senior Harold Ekeh scored the same number of Ivy acceptances. “I am elated, but most importantly, I am thankful,” Augusta, 17, told school officials at Sewanhaka Central High School District. Augusta’s older brother Johnson told NBC News that Augusta’s “initiative and perseverance,” as well as the family’s emphasis on learning, were responsible for his sister’s success. And the apple doesn’t fall far from the tree, as both their Nigerian-born parents are college-educated, and her father has a master’s and doctorate from the University of Indianapolis. “Education is very paramount in our family,” said her brother, who also made his way to the Ivies. He is a freshman at Cornell University, studying biological engineering. He said that while his sister was co-founder of her own tutoring service, she also works at another tutoring center on Saturdays. Members are chosen from the fields of literature, music, and the fine arts. Members must be native or naturalized citizens of the United States. They are elected for life and pay no dues. New members are elected only upon the death of other members. This year 12 new members were elected to the American Academy of Arts and Letters. One of the 12 new members is John Edgar Wideman. Wideman is the Asa Messer Professor and professor of Africana studies and literary arts at Brown University in Providence, Rhode Island. Before joining the faculty at Brown, Professor Wideman was a Distinguished Professor of English at the University of Massachusetts at Amherst. Professor Wideman grew up in Pittsburgh and then enrolled at the University of Pennsylvania where he was an all-Ivy League basketball player. His senior year at Penn, Wideman was named a Rhodes Scholar, the first African American to win the honor in over a half century. After returning from Oxford, Wideman graduated from the Iowa Writer’s Workshop. Professor Wideman is the author of numerous novels, short story collections, and memoirs including Brothers and Keepers (Henry Holt, 1984) and Fatheralong: A Meditation on Fathers and Sons, Race and Society (Pantheon, 1994). CHICAGO — Kenwood Academy‘s valedictorian, Arianna Alexander, wants to go to college to learn about business. As it turns out, she has a number of options. “It was a lot to take in. I received emails, letters. It was just like, ‘Come here, come here!’ They were bombarding me with all this information,” Arianna said. Arianna hails from Chicago’s Hyde Park neighborhood. She graduated with a 5.1 grade point average on a 4.0 scale. She was accepted to 26 universities, including six Ivy League schools. Her scholarship offers total more than $3 million. “I feel like it means I can afford college and I don’t have to worry about it. I feel like that’s an issue for a lot of people my age,” Arianna said. Her father encouraged her, after another Kenwood student was offered more than $1 million in scholarships a few years ago. “I planted the seed in Arianna’s mind that you can do the same thing. So when the process got started and a million was achieved, let’s go for two. I said let’s go for three and she did it,” said Pierre Alexander, Arianna’s father. Arianna is the baby of the family. She has three older siblings. “It was a big blessing, because I’ve already put three through college. Now I don’t have to worry too much about her,” Pierre said. Arianna has also picked a school, thanks to Paul Brush, one of her teachers. She plans to attend University of Pennsylvania. “He said, ‘Do you know about the Wharton School of Business?’ I said, ‘I have no idea what you’re talking about,'” Arianna said. “As teachers, we have a big moment to play with the lives that we have in our classrooms,” Brush said. “My wife and I have always stressed to her, if you do your best, you will be the best. So we try to make sure she upholds to that,” Pierre said. “So as long as you work hard, I feel like there is always a way for you,” Arianna said. After all, there is still more to achieve besides high school. “When she graduates from Penn, that will be a second goal. We expect bigger and better things for her,” he said. Arianna said she wants to be an entrepreneur and plans to own four restaurants. She’s already working on the menus. Three days ago, Good Black News shared an article about Washington D.C. wunderkind Avery Coffey, who was accepted to five Ivy League colleges. Today, 17-year-old New Yorker, violist and aspiring physician Kwasi Enin went one better – make that three better – and earned acceptance to all EIGHT Ivys! According to usatoday.com, the acceptances began rolling in over the past few months, and by late last week when he opened an e-mail from Harvard, Enin found he’d been accepted to every one. School district officials provided scanned copies of acceptance letters from all eight on Monday. Yale confirmed that it was holding a spot for Enin. The feat is extremely rare, say college counselors — few students even apply to all eight, because each seeks different qualities in their freshman class. Almost none are invited to attend them all. The Ivy League colleges are among the nation’s most elite. For most of the eight schools, acceptance comes rarely, even among the USA’s top students. At the top end, Cornell University admitted only 14% of applicants. Harvard accepted just 5.9%.